All offices will be closed on September 7th in observance of Labor Day as well as September 24th for National Indian Day. On August 8, 2015 the Duckwater Tribe held a Special Election for the purpose of filling the unexpired terms Virginia Sanchez and Ruby Sam. Lorin Watson and Alissa Thompson were voted the successful candidates and will serve the remainder of the terms that expire in December 2015. The Regular Election for those terms is scheduled for December 19, 2015. The Tribal Council has set to fill the unexpired seats of Virginia Sanchez and Ruby Sam for Saturday, August 8, 2015 from 8:00am to 12:00pm. Both seats expire December 2015. The 38th Duckwater Annual Festival is scheduled for June 19th-21, 2015! Duckwater Festival is generally held on the last weekend in June annually. The Festival dates back over thirty years and currently encompasses a Pee-Wee Rodeo on Friday afternoon, followed by the Grand Entry and Pow Wow and Hand Game Tournament beginning that evening. Saturday morning kicks off with a Fun Run/Walk sponsored by the Health Department. 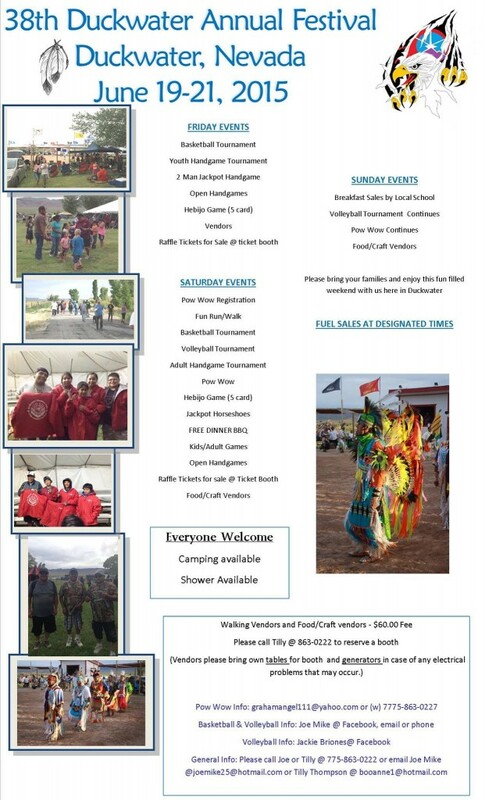 The days activities include Horseshoe Tournaments, Basketball and Volleyball Tournaments, Kids and Adults games, Raffle, Handgames and Pow Wow, a Duckwater grown beef barbecue on Saturday afternoon and a live-band dance Saturday night. Breakfast is available both Saturday and Sunday and camping on site if free. RV camping is available in our newly created RV spaces; however, there are only 5 spaces available and will be served on first come, first served basis. Reserve early. Duckwater is home to several community activities during the year. With the elementary school come activities such as the Halloween Party and Carnival; Back to School night, Graduation ceremonies each spring and Christmas program. The Health Department takes responsibility for the annual Veteran’s Day celebration and potluck dinner honoring all veterans in Duckwater and Railroad Valley. The administration sponsors the annual Christmas Community Dinner. Various other activities are held annually including spring planting in the community garden, Reservation clean-up by staff and the annual cleaning of the Cemetery prior to Memorial Day. On December 20, 2014, The Duckwater Shoshone Tribe held their annual election for the purpose of filling the expired term of Annette George. Kathy Adams-Blackeye was voted the successful candidate and will serve a 3 year term December 2014-December 2017. Click here to download the 2nd Quarterly Newsletter 2014. Click here to download the February 2014 Newsletter. These pictures were taken just after they finished all repairs and painting, after the flood happened. Everything looks great and now the clinic staffs are ready to move back in. Click here to view the Health Department Update from the Health Manager.